I’ve owned the Kindle Fire for about 15 hours now and I’ve gotten a pretty good grasp on how everything works so far. I took some video recordings of me playing around with it, so check out the video below. I’ll start first by saying we should all stop using the phrase “iPad killer” to describe (or potentially describe) any new tablet device that comes on the market. I say this because just like with the iPhone, Apple will always retain a specific share of the market. They have a different eco-system that connects all their devices, so it’s hard to compare new devices and software. With that said, it should be noted that if you’re using the phrase “iPad killer” to strictly define actual specs of the hardware, then the Amazon Kindle Fire is certainly not an iPad killer. However, that’s ok! In my opinion, it was never intended to be a direct alternative to the iPad. After what I’ve seen so far, the Kindle Fire is simply an e-reader with some extra bells and whistles—and for only $199, that works perfectly. 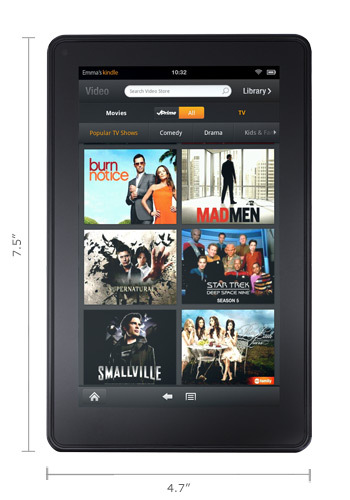 The Kindle fire is tiny. On Monday, I received the Marware Kindle Fire case that I purchased and it was the first time I got to feel what I was going to be holding the next day. I find that its smaller form factor (when compared to the iPad) is much more convenient. As a male, I don’t have the luxury of carrying around a purse or a handbag to be able to throw a hefty tablet into, so being able to carry the Fire around like a tiny book was key. The weight of the Fire is 14.6oz which feels a bit heavier than an average bottle of water. This doesn’t seem to cause the same stress pains that holding an iPad will give you after some time. The combination of size and weight also make the Fire much more manageable with one hand. I’m new to Android and although I had an Android phone for a short while, I’m not too familiar with how fast this OS should run. 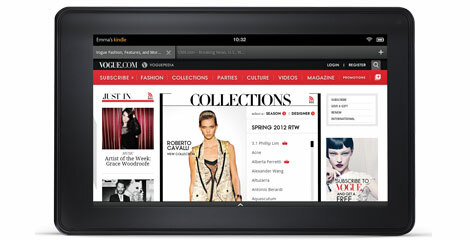 However, the Kindle Fire does boast a OMPA 4430 dual-core ARM A9 processor that clocks in at 1GHz. This, coupled with the Android-based operating system, creates a very fast user experience when navigating through your device’s content and opening apps and books. You’ll notice a slowdown when loading graphics intensive items such as a game or a full-color magazine, but nothing to complain about too much. When reading books, the Fire is very responsive and has hardly any lag when turning pages, performing text searches and recalling bookmarked locations. As a trial, I signed up for the Kindle Fire-only Maxim magazine to see how well a full-color digital magazine appeared and I was pleasantly surprised. This is where the speed really shows its capabilities. Because the magazine is a direct copy, page for page of digitally scanned images, it runs a bit on the slow side. But we’re not talking about full seconds here…it’s just noticeably slower than reading through a standard Kindle e-book. One very important note to consider before buying the Fire is that it only has access to apps within the Amazon-Android app store! This is different than the regular Android app store. The differences have yet to be fully explored yet, but I noticed it when trying to find the Chase Bank mobile app. 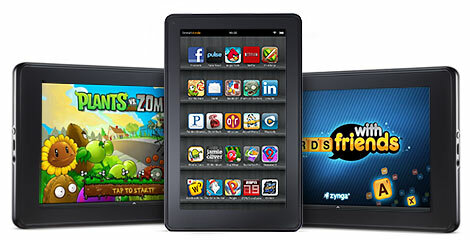 I know they make an Android version, but so far, it is nowhere to be found on the Kindle Fire. I can’t say for sure why some apps wouldn’t be available, but I thought I’d point out that fact anyway just so you understand that you may not have access to all of the Android apps you’ve come to love. The few apps I’ve installed so far (Angry Birds Rio, eBay Mobile, Netflix and Pandora) have all performed very well. They all load very fast and have no lag when running. One complaint I have about the apps is that there are a few default apps like Comics, ESPN and IMDB that come on the Fire (but aren’t necessarily installed) in which I can’t get rid of. Any app that you personally download and install can be removed by tapping and holding the icon and then tapping on ‘Remove from device’, but these other default apps are stuck with you. The Amazon Silk browser seriously beats Safari on iPad. With tabbed browsing and the ability to return exactly where you left off (not always the case on iPad) make this browsing experience compelling to say the least. It was also refreshing to finally open a Flash webpage on a mobile device without being devoid of content! I haven’t played around too much with the Internet yet, but Amazon claims that over time, the browser will have cached enough data into the Amazon Cloud that it will be able to load pages faster based on previous web history and trends. In other words, if you’re going to more shopping sites than blog sites, those pages will load much faster. Also, the ability to bookmark a webpage and have it stored exactly like it appears online is a huge bonus for people who might want to continue reading a page after they’ve exited a wi-fi area. I’ve already discovered a few minor things that have irked me a bit. I’m sure in time, some of these will get fixed with software updates, but for now, here’s what I don’t like about the Kindle Fire. No physical home button – Apple got this one right for sure. I love a streamlined look, but it’s always nice to have an actual button that will always bring you back to the start. No military time – This is merely a preference, but you’re not able to show the current time in military format, which is commonly used around the world. Can’t change home screen image – When the screen is locked, the background image randomly changes each time, but you’re not able to change it. No app notifications – iOS devices put little notifications on app icons that have updates such as a little number counting how many emails are in your inbox. The Fire doesn’t have these. No app folders – All you have is a favorites list that allows to you place your most used apps on the home screen, but you can’t organize them any other way. I could probably go on all day with the ups and downs of this device, but I’ll end it here and summarize with this: the Kindle Fire is a wonderful device for anyone looking to purchase an e-reader that has a lot of extra features. For me, I sold my iPad because I wasn’t using it as much as I thought I would. 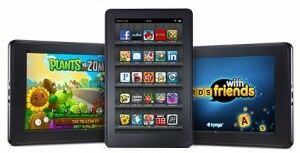 In my case, it became a super expensive e-reader so the Kindle Fire was the perfect replacement for me. At only $199.99, you can’t go wrong. Is it an iPad killer? Certainly not, but it is a worthy competitor and it will likely steal all of the consumers that are on the fence about getting an iPad or not.